Share the post "What Is Forex and What Is Everyone Trading?" What is Forex? Foreign Exchange is the currency market and consists of different currency pairs that you’ve probably heard of and these currencies are the form of trade used in different countries around the world. Forex trading is basically buying and selling in currency pairs, these pairs are the value of the two currencies against each other, for example the EURUSD pair, anyone who buys this pair is buying the EURO against the US Dollar and anyone selling this pair is buying the US Dollar against the Euro. The current price of this pair reflects what 1 EURO is equal to in Dollars, the current rate as I write this is 1.35452, so that means 1 Euro is 1.35452 US Dollars. Though these are the major pairs, there are also a lot of other pairs made out of these other currencies paired together, for example, GBPCAD which is Great Britain Pound against the Canadian Dollar. Along with these currency pairs, most Forex brokers will also provide you with the capability of trading exotic metals, like Gold and Silver and Commodities like Oil and Natural Gas. This index is a measure of the US Dollar’s performance against a few other major currencies. The USDX Index is tradable as a futures contract, the dollar index adds gains if the US Dollar strengthens against these other currencies. To trade Forex, you need a broker. Unlike old times, now you can find a broker online and have your account set up in a couple of hours or less. You can charge your credit card for a little of your trading money but its suggested you wire in your money to the broker to save some transaction costs. Once you’re set up with your broker, you can start trading instantly. Before you add any real money into your account be it with any broker, you should try out a demo account before trading real money to get the feel of trading and get used to the trading platform as well. Trades are opened by traders by taking positions in pairs, they can sell or buy any pair they like according to their own trade ideas or fundamental thought process. There are three basic types of positions that traders can take up, Micro lots, Mini lots and Standard Lots. Standard Lot These are the position sizes used when Forex trading started in the beginning, but since then transaction costs went up and traders were offered to trade in smaller lot sizes. These positions are called 100,000 units of a currency. To make it simple for you if you purchase 1 Standard lot, your profit and loss movement per pip will be $10. What is a pip? A pip is a movement of 10 points in any major currency pair, for example if EURUSD moved from 1.35000 to 1.35010 that would be a movement of 1 pip. Mini LotsThis position size is 1/10th the size of a standard lot. 10,000 units of a currency and your profit and loss movement per pip while holding this position is $1. Micro Lots These are very small position sizes and are 1/100th of a standard lot. 1,000 units of a currency and your profit and loss movement per pip while holding it is $0.10. I’ve looked around a lot in my time and traded with a few brokers but when it comes to trading you always need someone reliable. What to look out for is the possible spreads, fast execution time, no dealing desk and great support. I found ICMarkets to be pretty amazing with spreads on its ECN, has amazingly fast execution on orders and no dealing desk. 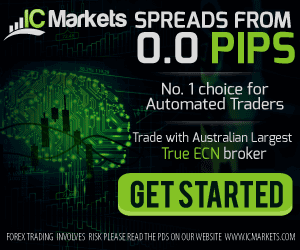 There’s also FXCM they are worldwide and have a huge user base, they also offer a lot more commodities and trading instruments than most brokers. You can check these guys out or if you have a better broker in comparison, please do let me know. When you start trading Forex, you will see that there’s a small gap in the amount of the buy price and sell price of a currency pair. That difference in amount is called spread. This is what the broker makes off you when you trade. When you start a trade the spread is normally what you are minus and you have to cover that up before you get into profit in the first place. There are a few introducing brokers out there that will make you sign up to a broker through them and then give you cash backs on the spread you pay as well, they aren’t going to give you the whole amount but it’s at least a little coming back to you. The Economic Calendar outlines all the daily and weekly news events that have happened and will happen in the near future. It is a must have to for any Forex trader so they can track news events that could effect their trades. Major movements take place at some of these news events and all the news events are listed with their importance and the kind of impact that they have on the currency market. So is this information enough for you to start trading? Before you go ahead and start trading it’s highly recommended that you read the information on Forex trading available on our website, so you can understand the risks that come with trading currencies and are able to trade them responsibly and at least stand a chance of making a profit. You will find out about things like risk reward and money management, placing your stop losses and how to draw up fibonacci retracements plus you’ll find a lot more. There are new trade ideas here often too, so you might want to check in or subscribe to get regular updates, you could also follow us on twitter. If there’s something you can’t find there, please feel free to leave me a comment about what you need to know and I may do a write up on that topic as well! There’s a lot more to what Forex is though it’ll take a lot of time and patience on this journey if you want to try trading currencies. A lot of people think of trading as a quick money type of deal but in all honesty that is a wrong perception. Those that try to make quick money out of this market fail in the long run. The only way to survive in trading is to manage your risk and keep trying to achieve your goals with a set of rules that will help you achieve your goal in the long run. So what is Forex? Got an idea now? If not.. leave me a comment and tell me what you need to know!